Once again the Philippines’ best young players will be tested in international play. 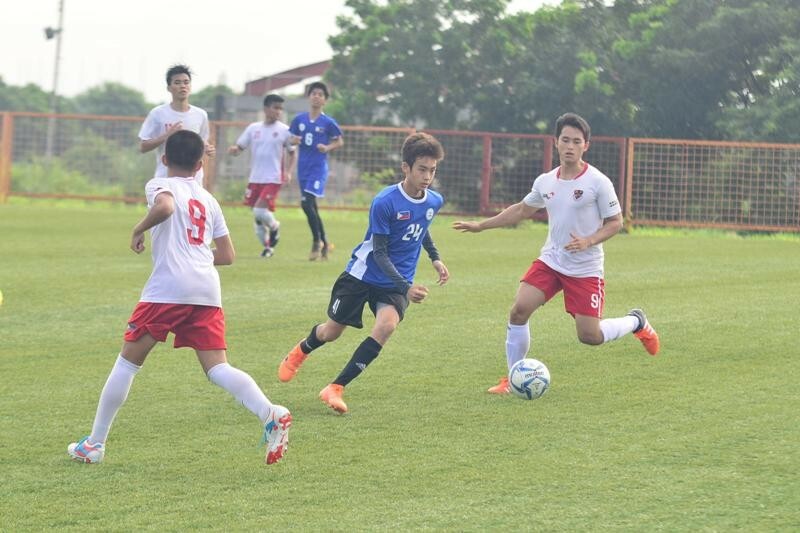 This squad, like other Philippine national youth teams, concluded their training camp at the PFF Artificial Turf Pitch in the San Lazaro Leisure Park in Carmona, Cavite last Wednesday. The pitch is part of the PFF national training center. The Philippines kicked off this campaign with a match against the hosts on July 29. It was a difficult game, with Indonesia running out 8-0 winners. Two days later they will try to bounce back against Cambodia. August 2 will see the Pinoys dueling with Myanmar, followed by a tough match against Vietnam on the 4th. The group stage will end with a test against Timor Leste on August 6. The top two teams proceed to the semifinals. The celebrated Sandro Reyes, a Marinduqueno who was trained in the FC Barcelona youth system, is in the side. The attacking midfielder is currently in the youth team of FC Sants, a club from Catalonia in the Spanish third tier. This is Sandro’s second campaign with a youth national squad. Reyes’ Sants teammate, Antoine Ortega, a Filipino-Frenchman, is also going to Surabaya. Ortega plays in the holding midfield slot deeper than Reyes. Hopefully their club chemistry will help the national team score goals in this tournament. Up top is Filipino-American TJ McDermott, from Fredricksburg, Virginia. The striker is so gifted that he is reportedly on the radar of the USA national youth team program. McDermott will be playing this competition with a heavy heart. His father passed away while he was enroute to the Philippines for this camp. McDermott elected to play anyway, perhaps believing that his late father would have wanted it that way. Another notable on the squad is James Tuazon, a gifted Ilonggo attacking mid from Central Philippine University who has impressed coach Reiji Hirata. “He can control the game and he has good ideas (on the pitch),” says the veteran Japanese mentor. Hirata was also effusive of Ortega, noting his his organizational skills and leadership, as well as his decent shooting. The coach also said that Reyes “can make a difference,” and praised his one-touch passes that often leave defenders confused. Another talented striker is the towering Renard Yu from Xavier School. Florenz Tacardon is also in the squad. The Claretian winger, whose older brother Fidel scored the game winner in the U19 team’s 2-1 win against Singapore is also in the roster. Atenean Andy Roxas, nephew of former national team player Randy, is a box-to-box threat while Khent Brian Valenzuela is another offensive weapon from Iloilo. The first-choice goalie is Franc Barrera from San Beda. The native of Basilan was scouted in the Mindanao Peace Games. Hirata admires Barrera’s reactions and pointed out a huge save he made in Wednesday’s scrimmage win against Claret. Hirata also appreciated the PFF Artificial Turf Pitch within the San Lazaro Lesiure Park where the team trained. He noted that it is the same quality as the synthetic turf fields in Japan, and he is eager to see the planned dormitories, classrooms, and offices that will help complete the center. “As always we are proud to play our role in boosting the performance of our youth national teams,” says Manila Jockey Club VP for Marketing, Eduardo Ramirez de Arellano. MJC manages the facility. “We are sure that training on the world-class field in Carmona could give this talented squad an edge in Indonesia. While the pitch is intended for the use of the Philippines’ national teams, it has also hosted PFL matches and other football events. Manila Jockey Club is opening up the pitch for rental for anyone needing a pitch for field sports. The PFF Artificial Turf Pitch in Carmona measures 105 meters long and 68 meters wide, the preferred dimensions for elite play. The surface has passed the FIFA Quality Pro standard, formerly known as FIFA 2 star. Recently hundreds of new seats were installed around the field, making it an even better venue for spectators. Soon light towers will be installed, permitting nighttime play.